Did you all have a Happy Easter? I certainly did. I think I ate enough ham and Oreo pie for the year, HOWEVER, I still brought some food back from my parents’ house to enjoy today. My mom makes the best holiday meals EVER! Everyone in the family looks forward to her incredible food. Now that Easter has come and gone, I’m really looking forward to enjoying spring and welcoming in the warm summer days. 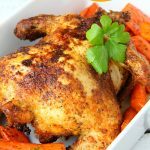 I’ve been thinking about fun outdoor activities for our family, early evening walks, sun-kissed skin and what to plant in our little patio garden next month. This is one of my favorite times of the year. Unlike the cold winter months, in spring and summer, I actually jump out of bed, ready to start my day! The other thing I love about summer is lounging outside sipping on cool drinks. 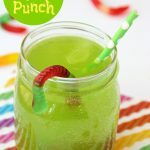 This Gummy Worm Punch is a perfect drink to serve on a hot summer day, not to mention perfect for bug- or mad scientist-themed birthday parties, St. Patrick’s Day, Halloween and impromptu picnics in the yard. 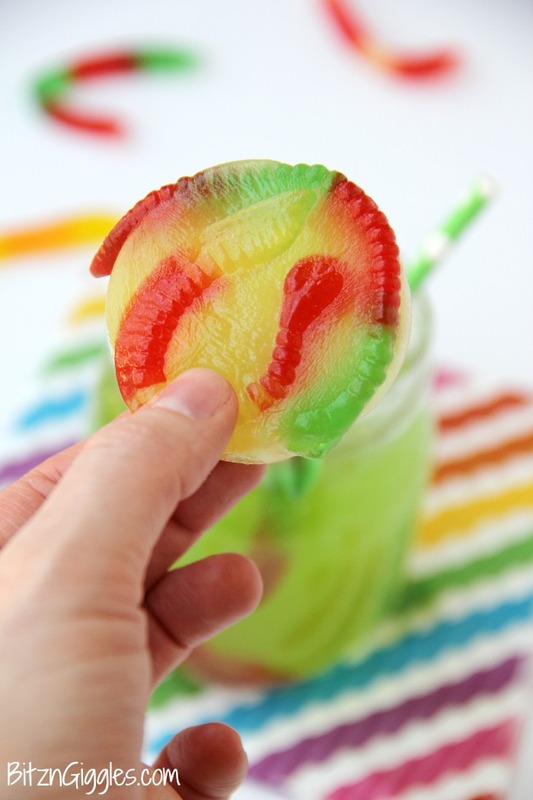 Kids love the color and, well, get pretty excited about the *stars of this drink*, those wiggly gummy worms, too! 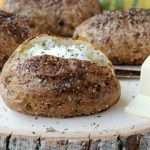 Super simple and so easy to make in a pinch! 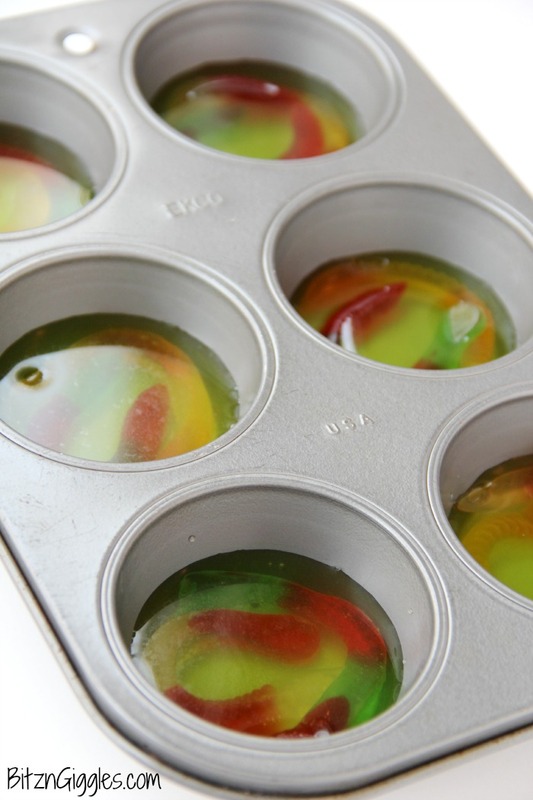 What makes it unique is “the freezing of the gummy worms.” You start by filling each cup of a muffin tin with two gummy worms. 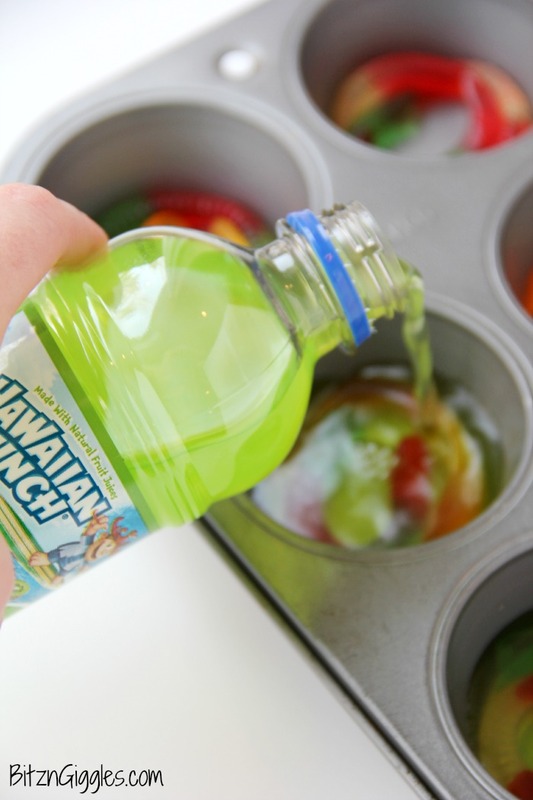 Pour a little Hawaiian Punch into each muffin tin. Just enough so it covers the worms. If you have a few little pieces of the worms sticking out of the top of the liquid, that’s fine! Place the tin in your freezer and allow the “disks” to freeze – usually 2-3 hours is sufficient. When the disks are ready, they’ll look like this! Alright, so when you’re ready to serve the drink, fill 3/4 of the glass with the Hawaiian Punch and 1/4 of the glass with lemon-lime soda. Make sure to not fill it too full because you’re going to be dropping in one of the frozen gummy worm disks. Note: If you’re making this punch for a large group, just fill a punch bowl, following the same instructions as above – 3/4 Hawaiian Punch, 1/4 lemon-lime soda. I would make at least 12-24 frozen disks for a punch bowl. Drop the disks into individual glasses immediately before serving. If you’re looking to keep the punch, itself, cold. You could freeze some Hawaiian Punch the day before in a ring mold or in ice cube trays to add to the punch the day of the party. 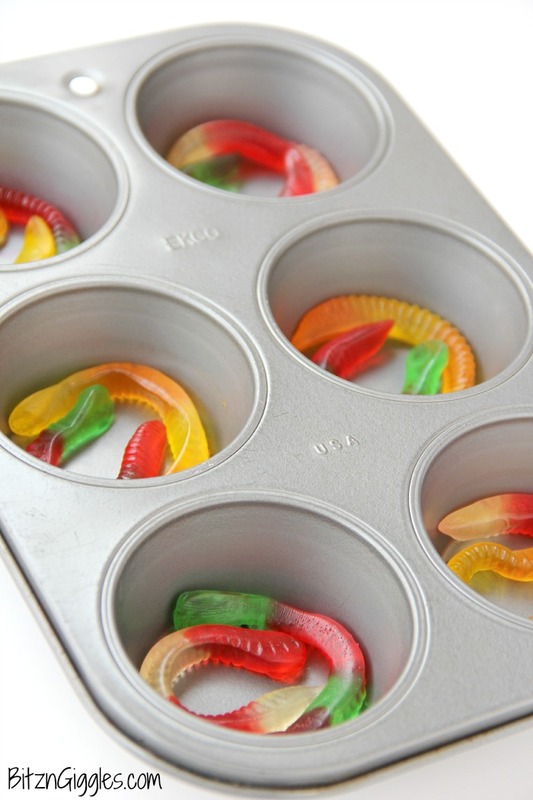 If you’re really adventurous, throw some worms into the mold or the smaller cubes, too! Depending on the size of the glass, I’ll put one to two disks in per drink. The disks sink to the bottom of the glass, cooling the punch, and in about a minute or so, the worms begin to emerge from the ice and little pieces of the ice float to the top, making the drink look like it has a little slime on top. LOVE that. See the little patch of “slime” on the top of the drink by the straw? How cool is that? Worms always leave behind slime don’t they? Well, they do in this punch, too! I’ve found that it’s sometimes best to serve this drink to the kiddos outside. Why? Well, because they like to dig to the bottom of the glass to grab the worms out. And. . .if you’re familiar with how little minds work, they usually don’t have enough patience to wait until the punch is gone before they start hunting for the worms. If you’re serving the punch indoors, just make sure they’re at a table when they’re drinking it. 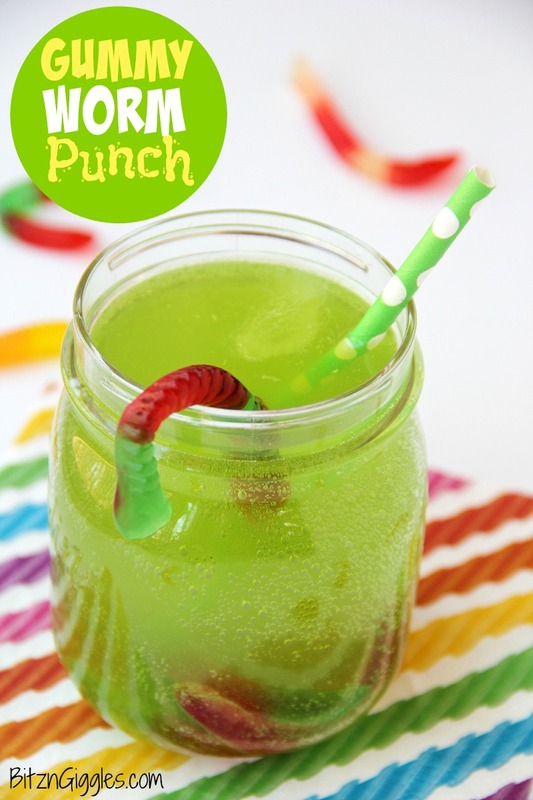 There may be a little extra clean up, but watching kids drink this punch is half the fun! I know what you’re thinking. Cool, idea, but does this actually taste good? It does! The Hawaiian Punch has a wonderful berry flavor and the lemon-lime soda gives it a little tartness along with a touch of carbonation. The worms are just there for eye candy and, well. . .candy, candy. Pin this, share this and plan to make this punch!! The kids will flip over it, I promise. 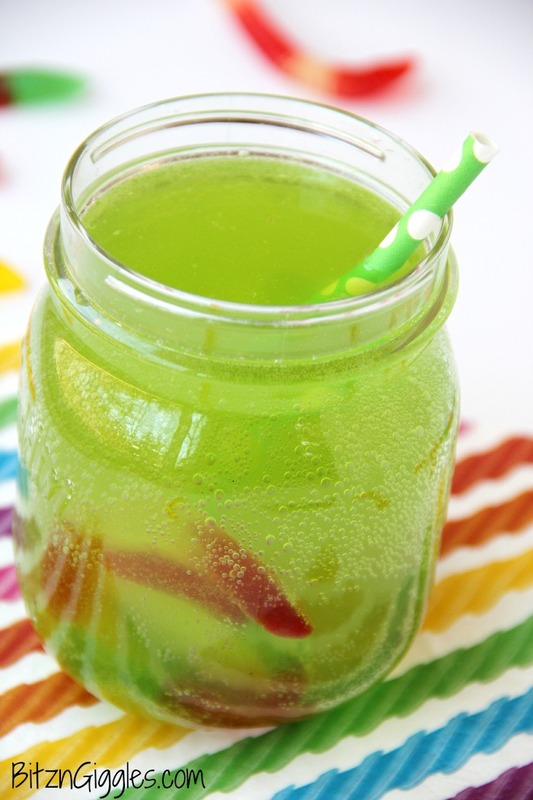 Kids will love sipping on this drink in the summer! Great idea for birthday parties, St. Patrick’s Day and Halloween, too! 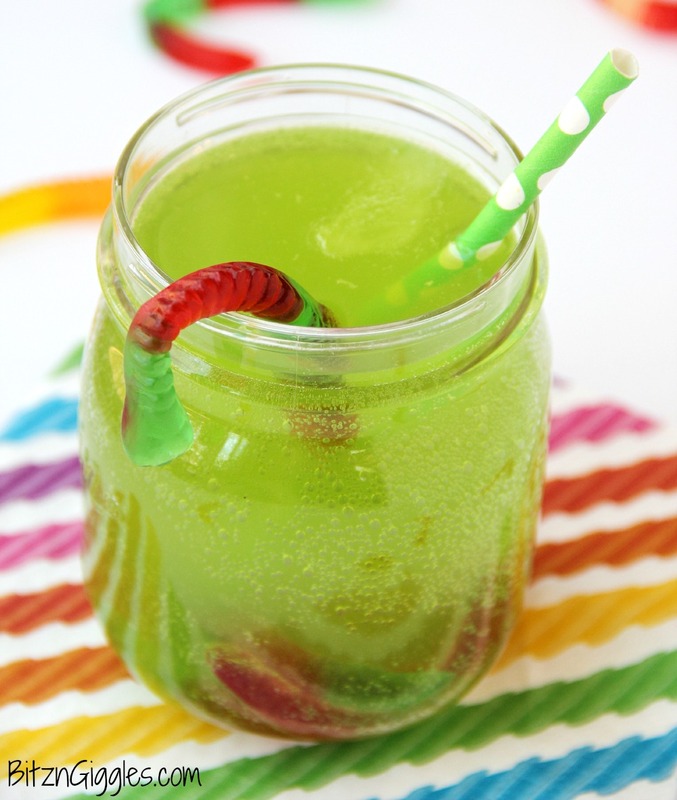 Gummy worms are frozen in a punch mixture and emerge from the ice as the drink is enjoyed! So much fun! Place two worms into each muffin tin and fill with Hawaiian Punch until worms are just covered. Fill a glass 3/4 full with Hawaiian Punch and then add lemon-lime soda to fill the glass. 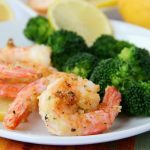 Drop in a frozen worm disk and serve immediately. Okay, I love this SO much!!! Great idea for kiddos! How cute! My niece would love this. So creative and fun! Holy cow, my kids would go nuts over these! I’m pinning these for the first day of summer break! Oh my gosh, this is SUCH a fun idea! I can picture these in so many drinks all spring and summer long. This is such a fun idea! My boys would love it! 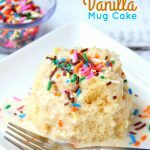 Such a fun filled party idea for kids! My boys would love it! Nope! Never too early! It’s an awesome holiday! I made this today for our family gathering and everyone loved it!!! Thanks! So glad to hear that, Dawn! That punch is a lot of fun!